The Onion Creek Bench trail is located in the Fisher Tower/Onion Creek area of Professor Valley east of Moab, Utah. The trail begins near the Onion Creek Campground where it follows a shallow wash up to a bench that leads it to an equestrian trails parking area just off of Highway 128. Scenic views of Fisher Towers, the La Sal Mountains, Castle Rock and the iconic Priest and Nuns rock formations provide hikers and horseback riders a grand reward for their efforts. To get to the trailhead travel north out of Moab toward Arches National Park and turn right onto Highway 128 before crossing the Colorado River. Continue for about 20 miles and turn right onto the Onion Creek Road. Follow the graveled road for 1 mile. 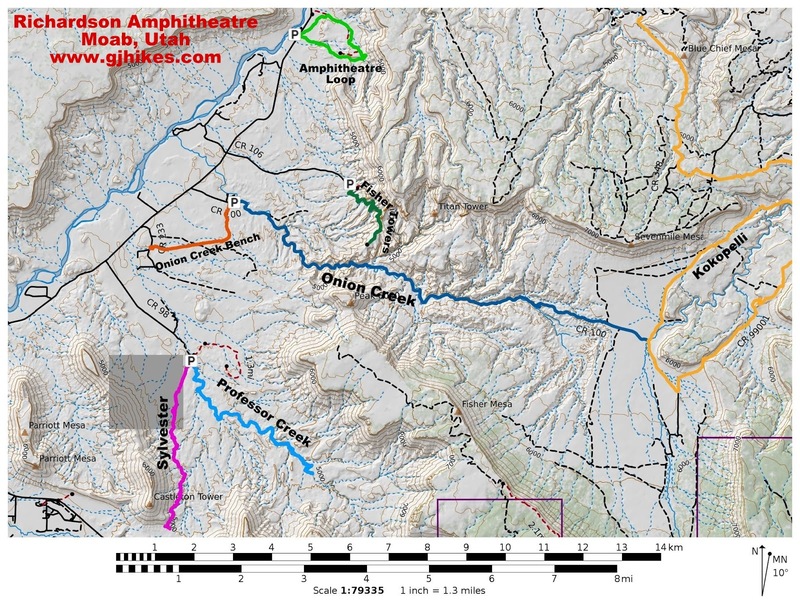 The Onion Creek Campground will be on the righthand side of the road and a large staging area on the left. The Onion Creek Bench trail begins in the wash just before reaching the campground. The Onion Creek Bench trail meanders its way up the sandy bottom wash for just over a half mile. The trail reaches a fork in the wash where it follows the smaller branch on the right. After traveling up the smaller wash for a ways it comes to another fork where it takes the middle ground up a ridge to the bench area. From here on the trail makes good time as it crosses the rolling mesa. At the 1.25 mile point the trail crosses a jeep road. And at the 1.8 mile point, as the trail nears its end, it once again enters another wash. The turnaround point for this post and the end of the Onion Creek Bench trail is at a horse trailer parking area. This group of hiker/equestrian trails are new enough that they don't show up on any maps that we have seen. There is a map on a trail sign at the parking area that seems to suggest that a big loop could be made that would eventually lead us back to where we began at Onion Creek. We will have to investigate that route at a later time when we aren't running out of daylight. Here are a few pictures that will give you an idea of the kind of scenery that you can look forward to. Cloud silhouettes over the Fisher Towers. The BLM in the Moab area seems to put in a lot of good work creating trails and venues for all forms of recreational activity that are appropriate for the area. 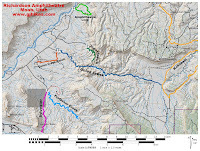 When it comes to trails Moab is well known for its miles and miles of mountain bike and jeep trails but the BLM has gone a long way to add miles of horse trails into the mix. If you are unfamiliar with the standard rules of right of way on a trail you should know that hikers always yield to horses and everyone else yields to hikers. If you would like to see the Onion Creek Bench trail for yourself then all you have to do is mount your horse or 'Take a hike'.